Protecting my family from the Florida sun has been a frustrating process particularly since my children have very fair skin like myself and my husband. With my history of skin cancer, I am committed to doing everything within my power to protect them from skin cancer later in life. I am grateful that skincare protection has evolved so much in the past few years. In fact, Dr. Fischer® has an entire line of Ultrasol® sunscreens making it easier than ever to protect the entire family. Dr. Fischer® Ultrasol® Sunscreens are available in several formulas with one thing in common, it provides the “highest and broadest spectrum protection available today in a wide variety of skin-friendly applications and are suited to all skin types and activities under the sun.” I feel confident that Dr. Fischer® Ultrasol® Sunscreens provides my family with maximum sunscreen protection! 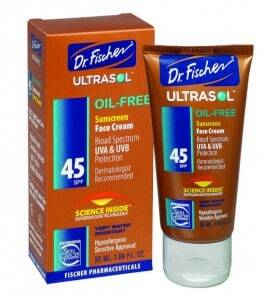 I was very impressed with the performance of Dr. Fisher’s® Ultrasol® Nature Baby Sunscreen Lotion in SPF 45. This thick, creamy formula contains oatmeal and aloe vera and just a small amount provided a lot of coverage to my children’s bodies. They were very appreciative that it didn’t sting their eyes (it has been ophthalmologically tested) and I was pleased that it is indeed very water resistant because I did not have to apply as often as I usually do with a different product line. It is recommended to reapply every 80 minutes and I found myself re-applying this product similarly at 65-70 minute intervals in the bright, Florida sun. Dr. Fischer’s® Ultrasol® Sport Sunscreen Lotion and Sunscreen Spray Lotion SPF 45 is my husband’s favorite sun block when he is mowing the lawn, biking etc. This sunscreen is highly resistant to sweat and water and it performs exceptionally well. My husband insists on partaking in outdoor activities without wearing a shirt (he is very fair skinned) and has had numerous sunburns much to my frustration. After seeing me undergo skin cancer treatment, he has been much more willing to apply sunscreen and he really likes these formulas by Dr. Fischer®. His favorite is the continuous spray because it is so convenient to use and the lotion also provides excellent coverage…a little bit goes a long way. I really like Dr. Fischer® Ultrasol® Sunscreen Face Cream in SPF 34 which is recommended by dermatologists and the Skin Cancer Foundation. It is a light creamy formula that applies nicely and my face and neck feels moisturized and protected against UVA and UVB rays. I have sensitive facial skin and did not have any irritation after using this product. It is also very water resistant so it is especially good for those hot days. The Dr. Fischer® Ultrasol® product that my children absolutely love is the “Cool Blue” Kids Sunscreen Spray Lotion. What makes it so special? This cream actually sprays a blue color that vanishes into the skin. My kids have never been so willing to have sunscreen applied to their bodies but they actually request for this spray. It provides SPF 30 protection so it is a good daily sunscreen that is pediatrician recommended and is hypoallergenic too. After-Sun Aloe-Vera Gel Plus is great to apply to the skin after spending time in the sun as it helps to prevent peeling. I like to keep ours in the refrigerator and it gives a burst of cooling and refreshing aloe vera to the skin. I am very appreciative that it does not contain alcohol as this is an ingredient in many other aloe vera after-sun type products that has been irritating to our skin. Utilizing aloe vera, chamomile and pro-vitamin B5 to increase moisture and natural antioxidant properties in green tea, this product actually helps keep my entire families skin soft and smooth. I also find that it is soothing on bug bites or when my daughter’s eczema flares up too. Dr. Fischer® Ultrasol® Sunscreens and After-Sun care products provide exceptional protection from the sun with Science Inside™ Superior Sun Technology. While testing these products, there was not one case of sunburn or overexposure of my family’s skin. I am very pleased with the entire line of Dr. Fischer® Ultrasol® products and we will continue to incorporate it into our daily skin protection routine. You are invited to visit the Dr. Fischer® website to learn more about Ultrasol® Sun Care products. Dr. Fischer® sunscreen products are available for purchase at Walgreens, Drugstore.com, Whole Foods and other retailers nationwide.